Dagmar Dolby and her husband, Ray, sound pioneer and founder of Dolby Laboratories, led a charmed life. But it was one they eventually found disrupted and forever changed by Alzheimer’s disease. It began when Ray started showing signs of the disease, which increased relentlessly over time. When his symptoms could no longer go unaddressed, Ray underwent a battery of tests and was diagnosed with Alzheimer’s. In 2011, Dagmar became acquainted with the Alzheimer’s Association, learning about its comprehensive offering of programs and services through the Northern California and Northern Nevada chapter. That summer, Dagmar and Ray attended the Alzheimer’s Association International Conference® (AAIC®) in Paris. While going behind the scenes of the world’s largest dementia conference through the Global Immersion Experience, it became clear to Dagmar that supporting the Association would be an important step in fighting this disease. 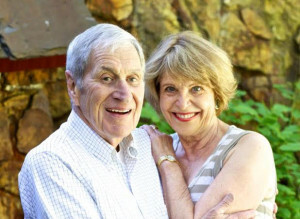 In 2012, Dagmar and Ray made their initial $1 million gift, joining the Zenith Society. Later that year, Dagmar went public with Ray’s diagnosis for the first time at the Walk to End Alzheimer’s in San Francisco, and she has been vocal about it ever since. She shares her story with friends, urging them to join her to raise awareness and funds for the Association. Dolby Laboratories has also participated in Walk to End Alzheimer’s, sponsoring the event in San Francisco and starting teams in multiple cities where the company has offices. Recognizing the importance of public policy, Dagmar built upon her existing relationships with Bay Area Congress members and attended the Alzheimer’s Association Advocacy Forum in Washington, D.C., to encourage legislators to give the disease the attention it deserves. “I’ll do what I can and continue to be a spokesperson whenever and wherever the Association needs me,” she said. Dagmar and Ray were inseparable throughout their life together, working as a team in all things — especially the fight against Alzheimer’s. Ray’s battle with the disease ended when he died from leukemia in September 2013. His death inspired Dagmar to increase her efforts for the Alzheimer’s cause. Recently, Dagmar made a gift to create a pilot awareness campaign in the Sacramento area. Targeting caregivers online and in doctors’ waiting rooms, the campaign promoted Association resources. “It would have been helpful for me to talk to people about the disease from the beginning — I didn’t have enough information and I didn’t know where to turn,” she said. The Association will take key learnings from the campaign and look to replicate it across the country. In 2014, Dagmar donated to the My Brain™ Movement. The gift will enable the Association to activate awareness efforts in the Bay Area, providing a platform to measure the potential for similar work in markets nationwide. Learn more about the Zenith Society at alz.org/zenith.